Automation is defined as using various control systems to operate equipment so that there is minimal human intervention. Progressive Automation can be used in office automation since users can upgrade from sitting desks to standing desks or even build a hybrid of both, which can be adjusted to be either through the touch of a button. After you’ve tried to use a standing desk for yourself and you’ve come to the decision that you need a more permanent standing desk, the next option is to buy or build your desk for full-time use. Below are some options to buy or build a more professional standing desk. You can choose to build a new standing desk from scratch. Building one from scratch is cheaper than buying one that is already professionally made. It gives you customization options well suited for you such as space restrictions, inclusions of shelves and drawers, or any other options you would want. You can start your standing desk using two filing cabinets, a door and four milk crates. Such an example of a standing desk will cost you a fraction of a pre-built one, and give you more options than the one pre-built. If you are limited for time and still want a standing desk, the only option left is buying one. Some great buying points for standing desks are outlined below. To start, one of the options is the Fredrik from IKEA which is like the gold standard when it comes to standing desks. 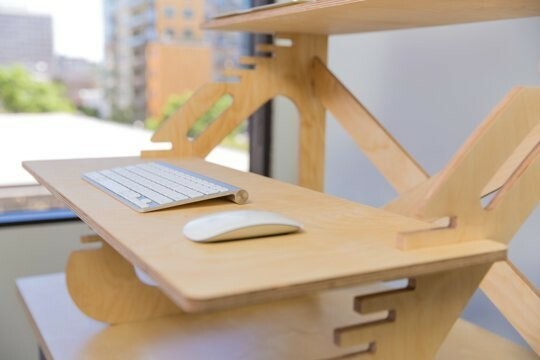 The FREDRIK is a simple standing desk. It is also adjustable and comes with a couple of accessories. Its price starts at $150 hence it is like the cheapest standing desk you’ll find around. 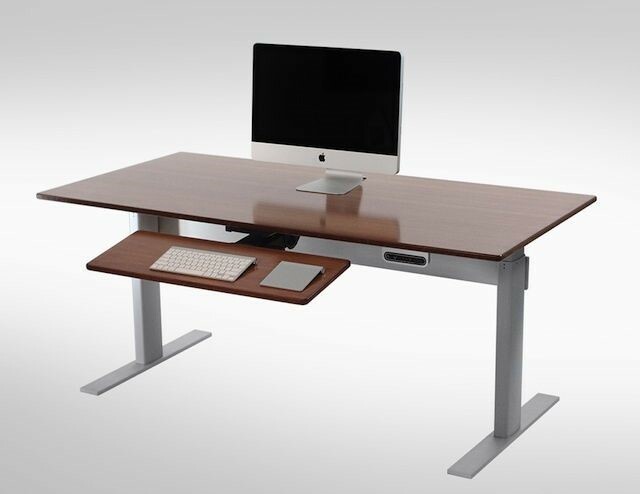 Ergotron can also customize a standing desk for you. An example is one that can attach to a normal desk, hence can be converted to a sitting/standing desk. The base model price starts at $380 and depending on the number of accessories you need for your desk, including a shelf, large keyboard shelf and monitor mounts, the price goes up. Another good option when you are looking to buy a standing desk is The GeekDesk. The best part is that is does not have a big working area but there is an adjustment to sitting height, all this done by the touch of a button. The GeekDesk comes in two different frames, sizes and the color of the desk-top. However, you need to cough out a little more cash to purchase it since prices start at $800. Another solution from IKEA that is simple and cheaper is the UTBY. It is suitable for a standing desk where space is limited and comes in two different heights. Its price starts at $140. If you want a portable standing desk, Tabletote is a place to start. It can be used as a standing or sitting desk. The Tabletote is a self-contained desk that you can pack in your bag and carry it with you wherever you go. Its price starts at $40 and hence a great portable desk option. If you are looking for a sitting or standing, corner desk, Ergodepot’s got you covered. This desk is more expensive than the rest since its price starts at $1,200, but it is worth it since it gives you a lot of desk space, and a standing or sitting option.